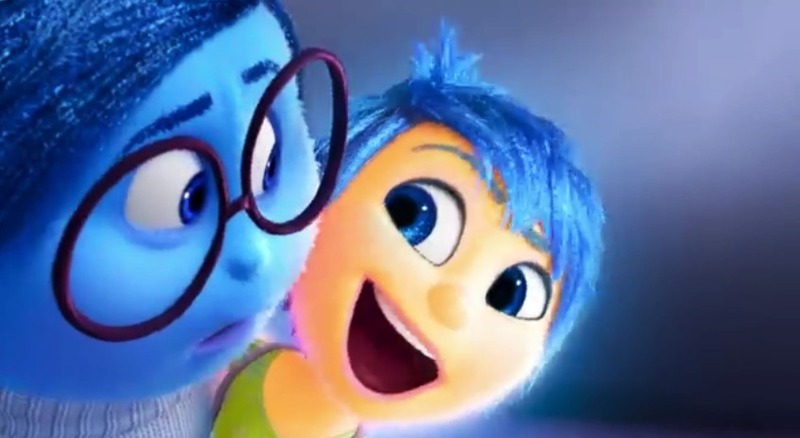 Box Office Watch: Inside Out breaks record and takes in more than 200 million worldwide! 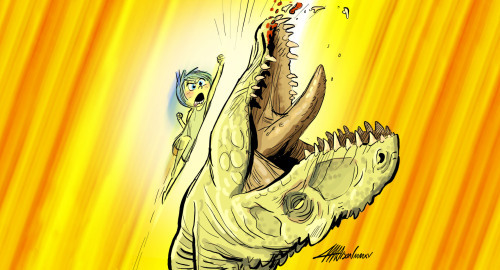 It appears Jurassic World won the box office battle against Inside Out. If it was a battle at all. Our post last week summarized this “battle”, but only because people were genuinely concerned that Inside Out would be the first Pixar film to not open at number one. Jurassic World did end up surpassing Inside Out last weekend, but the latter still broke records and scored impressive earnings. After its initial $34 million, Pete Docter’s major emotion picture became the highest grossing original film (not a franchise film or sequel, Pixar or otherwise) of all time, with more than $90 million. The record was previously held by James Cameron’s Avatar (2009), which opened with $77 million. In Pixar’s books, 2004’s The Incredibles grossed $70.5 million on opening weekend. As of right now, Inside Out‘s domestic run totals a whopping $184,945,000, with $266,445,000 worldwide. Scott Mendelson of Forbes reports that Inside Out is well on its way to $300 million domestically. That was the question on a lot of folks’ minds after Jurassic World scored a staggering $200 million worldwide on its opening weekend. It was a natural concern considering Inside Out was released yesterday, exactly one week after Jurassic World. But as always, Pixar has overturned expectations! Pete Docter’s latest emotional ride grossed over $34 million, with projections of $90 million throughout the weekend. What’s more, Universal’s sci-fi epic dropped to second place with $29 million. This puts Inside Out in second place behind Toy Story 3 ($41 million) and first place as the highest grossing weekend for a non sequel Pixar film. 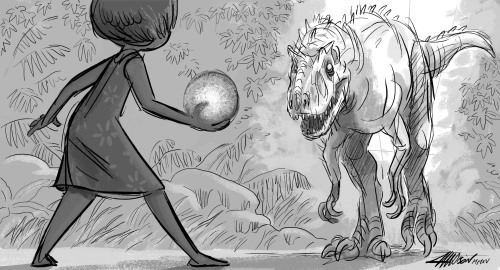 Pixar story artist Austin Madison depicted the competition and eventual Pixar victory in these two awesome drawings! It was a close call, but we can all jump for Joy! We’ll bring you more updates on Inside Out‘s box office earnings. Box Office Watch: ‘Monsters University’ Hangs Onto the #1 Spot! After a strong start, Monsters University continued its box office reign this weekend with around $46.2 million; a solid 44% second week drop, compared to Toy Story 3‘s 45.5%, Cars 2‘s 60.3%, and Brave‘s 48.6% declines. Accounting for the $42,395,979 pulled in over the week, Monsters University has made an impressive $171 million in the US to date. Overseas, where it’s already facing off with juggernaut Despicable Me 2, it’s grossed around $129.3 million. Next week brings the US debuts of Despicable Me and The Lone Ranger, the former of which should inevitably dethrone Monsters. If it holds up over the summer, though, Pixar could bring home a healthy $300 million in domestic earnings. Have you seen Monsters U yet? Box Office Watch: ‘Monsters University’ Nets Pixar’s Second Highest Opening Weekend! Despite some noteworthy competition, Monsters University took in an impressive $82 million in the United States over its debut weekend – Pixar’s second highest opening to date behind Toy Story 3! Unsurprisingly, it also continued Pixar’s unbroken streak of #1 box office openings. The movie also made about $54.5 million overseas, raising its total to $136.5 million. Next weekend should also bring in sizable earnings, but expect Despicable Me 2‘s July 3rd release to take away some considerable steam. Regardless, this should still be another monstrous success for Pixar, especially as it continues to open in worldwide markets over the Summer. Check back soon for more MU box office updates! ‘Brave’ Returning to Theaters for Labor Day Weekend! If you haven’t caught Brave in theaters yet, now could be your last chance before the November 13 DVD release. Like Toy Story 3 and Cars 2 before it, Disney is expanding Brave‘s theater count from 500 to 1,700 this Labor Day weekend to bring in some last-minute cash. To date, Brave has earned a solid $230 million domestically. With the summer movie season coming to an end after a humdrum August, the movie will leave most theaters following this engagement. Disney’s Dave Hollis explains, "We wanted to try it again and use messaging that says, ‘Get it while you can, one last time before these films head to video.’"
Pixar movies returning to the cinema has become a common occurrence as of late with Finding Nemo 3D, Monsters, Inc. 3D, and the recent Memorial Day AMC engagement. It could be many years, though, before Brave returns to theaters. To see if Brave is playing in your area, head over to Fandango. Otherwise, Brave arrives on DVD and Blu-ray on November 13. Will you see Brave one last time this weekend? Box Office Watch: ‘Brave’ on its Last Legs? After a month of financial success, Brave‘s major box office run could be nearing its end, with smaller earnings pushing it onward. During the week of July 16, the film accumulated $6,687,867 at the box office from Monday through Thursday. Against the box office juggernaut The Dark Knight Rises, Brave dropped to #5 over the weekend, taking in $6,024,987 (a 46% drop from last weekend). Likely to make sub-$1 million daily during the coming weekdays, the movie’s final push into the record books relies heavily on casual moviegoers and the dollar theater. At the moment, Brave‘s domestic total stands at $208,774,173, now beating out Toy Story and Ratatouille as well as Cars 2 and A Bug’s Life. The slow burn of Pixar’s movies in theaters will help move Brave towards a level of success likely around or above that of Cars. The film is also beginning to expand internationally, taking in $70.5 million overseas to date. Next week, the film will beat The Lorax to become the #1 animated film of the year domestically so far. Stay tuned for more news on Brave at the box office. Box Office Watch: Week 4: ‘Brave’ vs. ‘Ice Age’! NOTICE: From now on, we’ll be combining weekday and weekend box office reports for Brave into a single post. With new family-friendly competition arriving each week, Brave‘s profits have been gradually dropping throughout July. Many assumed that the arrival of Ice Age: Continental Drift this week would signal the end of Brave‘s major box office run. So how did the film perform? Over the week of July 9 through 12, Brave took in a modest $10,931,456, a 51.6% drop from last week’s weekdays. The real question, though, is how the movie fared against its biggest competitor to date. Surprisingly, Brave held up pretty well against Ice Age over the weekend; the film took a fairly standard 43.1% drop, taking in another $11,160,522. Its current domestic total stands at $196,061,319. Ice Age did, though, debut at #1 with a solid $46.6 million, knocking Brave down to #4. However, Ice Age‘s greatest success is in its international performance. Overseas, the film has grossed $339 million to date, in contrast to Brave‘s measly $46.8 million international earnings. Remember that Brave has yet to open in many major territories, including the UK. Next week, Brave will finally reach the coveted $200 million mark domestically, placing it among Pixar’s previous hits. To see how much farther the film will go, and to stay updated on Brave‘s rising international intake, check back soon. Box Office Watch: ‘Brave’ Retains the #3 Spot! Despite the rising force of new major films, Brave managed to hold onto the number 3 spot behind Ted and The Amazing Spider-Man at the box office. Between Friday, Saturday, and Sunday, Brave took in another $19,612,370 towards its total earnings of $173,969,341. As of now, the film has taken a step ahead of WALL-E, with an $11 million financial lead. The film has also beaten A Bug’s Life‘s total gross and will soon overtake Cars 2 and Toy Story. Hitting the $200 million mark shouldn’t be an issue, either. However, the film’s future success hinges upon how it will fare against direct competition like Ice Age: Continental Drift. Despite mixed reviews, Ice Age will likely be extremely popular with the same family audience that Brave appeals to. If all goes well, though, Brave should beat out WALL-E‘s domestic total and potentially that of Cars. Check back soon for updates. Do you think Brave will stand its ground against its most significant competitor yet? Box Office Watch: ‘Brave’ Weekday Totals (7/02-7/05)! Brave will likely lose steam at the box office soon with the rise of upcoming family-friendly alternatives, but the 4th of July weekdays gave Brave a slight boost. With grosses of $5,388,123 on Monday, $5,780,501 on Tuesday, $6,420,786 on Wednesday, and $4,999,227 on Thursday, Brave has accumulated a total of $154,356,971 domestically in its first two weeks of release. This is the fourth highest two week total of all time for Pixar, behind Toy Story 3, Finding Nemo, and Up. Brave is also beginning to lose theaters, dropping from 4,164 to 3,930 over the course of the week. The box office endurance of Pixar’s classics will hopefully hold through and keep Brave in theaters throughout the summer. Box Office Watch: ‘Brave’ Fares Well in Second Weekend! Although it was knocked to the number 3 spot at the box office by newcomers Magic Mike and Ted, Brave still managed to perform well this weekend with a fairly average second week drop. Brave took a 49 percent plunge this weekend, earning a solid $34,094,643 over Friday, Saturday, and Sunday. Noticeably better than Cars 2‘s performance, which plummeted 60 percent in its second week, Brave‘s earnings closely resemble those of WALL-E, which fell nearly the same amount in week two. Brave‘s current domestic total of $131,768,334 is also in line with WALL-E‘s $127 million at the same time in its run. Brave faces some notable competition in the coming weeks, but gradual global releases of the film should keep a steady flow of cash contributing to its current international total of $158,568,334. Where do you think Brave will end up financially?